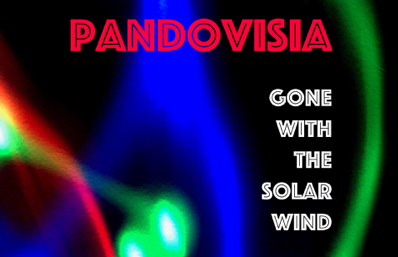 Net artists Pandovisia have recently announced the release of a mini LP titled Gone With The Solar Wind. The release marks the anniversaries of the Voyager space programme and the cult sci-fi TV series Space 1999. The duo's second album takes us to the far reaches of the solar system, and beyond. Exploring the ultimate challenge of single-sided communication, this record is conceived as a message in a bottle bound for outer space, including samples from the Voyager golden record and private audio clips. Gone With The Solar Wind is a story of reaching out to the unknown in search for love. In Pandovisia's world, the wandering Voyager probes and forever gone Eagle Transporter spacecraft are metaphors for hope and dreams of scientists, children and artists alike. From dreamy guitars of the instrumental pieces, floating through the vastness of space, to the contagious mid-tempo retro-synth grooves and assured vocal performances on tracks Silent Ambassador, Space 1999 and Outside The Solar System, Pandovisia develop their own musical and lyrical expression, a unique pop dialect introduced on their debut record The Last Man On The Net. Gone With The Solar Wind pre-release date 20 August 2017 marks the day of the launch of Voyager 2, while the official release on 5 September 2017 marks 40 years since Voyager 1 left this planet to become the first human-made object to leave the solar system and cross into interstellar space. Celebrating the Voyager anniversary, a video for the song Silent Ambassador is available on social media to accompany the release. Stream or download Gone With The Solar Wind from all major digital stores.